Wow, that's a pretty bold title. We all have dreams: big ones, small ones, easy ones, hard ones...but how many of those do we actually work to make a reality? Having dreams is a beautiful thing, but if we aren't taking actionable steps often, we'll never make them a reality. 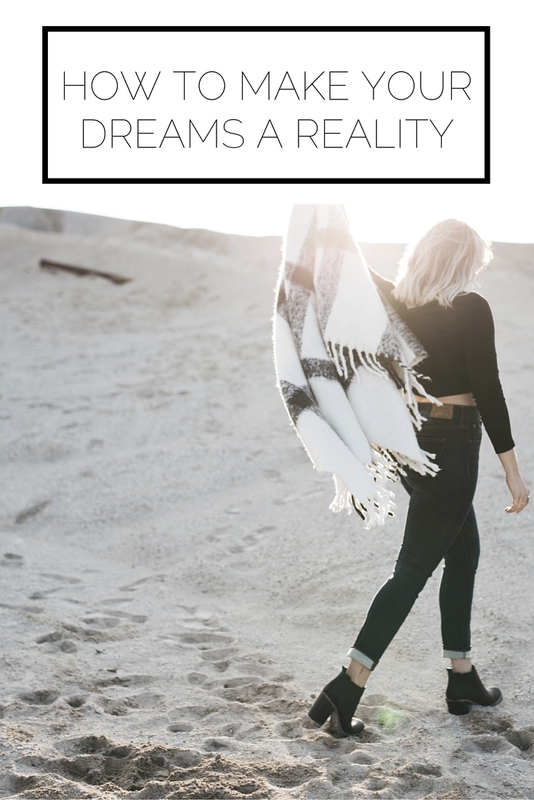 Today we're going to go through the steps you need to take to make your dreams come true! When are you happiest? Attending a concert? Visiting a new place? Dancing around? When are you most fulfilled? Is it when you finish a project? Make a new friend? When do you feel calm and at peace? You may not associate a feeling of calm with achieving your dreams, but to me a sense of calm is an indication that you are exactly where you need to be and are doing what you are meant to. I keep a running list of "Stuff I Want To Do." This list includes the attainable activities I want to do and for a level of accountability and to give you some inspiration, I'm going to share my list with you! What you'll notice about this list is that it's a mix of reaches (like big trips to India and a national park) and easily attainable goals (cooking, collaborating with a friend). This is so important because although you can chase big dreams everyday, you'll become so unmotivated if you are constantly striving without seeing results. What you can also see with this list is I kept it all fun; no career, school, or personal accomplishments here! While those sorts of dreams are incredibly important, they require a different level of work to achieve them (my post on discipline is a good way to get started, but if you're interested in learning more about my method of setting and meeting such goals, let me know in the comments!). With each of your dreams you need to have a plan to get there. Otherwise you're just going to be hoping and wishing without actually getting anywhere. Think about the steps you need to take and the timeline (for some things, like visiting a national park, I realize that it won't happen immediately, but is something to keep in mind for the next opportunity I have for taking a vacation) then WRITE IT DOWN! If you are just musing you won't actually do anything. I use Wunderlist for all of my list making needs, and what's so great about it is that you can add subtasks for each item. For example, I have subtasks such as find out about local concerts, book tickets, etc for my dream of going to a folk concert. By having clearly defined tasks you can more easily work towards making those dreams a reality. It is far too easy to wake up each day no closer to making your dreams a reality, but when you define what it is that makes you excited, translate that into activities, and take practical steps, you are on your way to achieving dreams left and right! What are your dreams? How are you going to make them a reality?